The Career Closet is OPEN! The Applied Learning & Career Center takes great pride in announcing that our new Career Closet is officially OPEN for business! The Career Closet, located in AT 120, provides professional clothing (at no cost) to students for interviews, job fair, internships, etc. This initiative will educate students on appropriate professional attire and ensure that all students have access to professional clothing that will help them feel confident as they pursue their career goals. 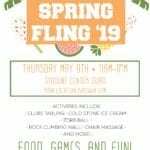 Eligibility requirements include: (1) at least 2 career coaching appointments at the ALCC, (2) a finalized resume and (3) a reason (interview, job fair, internship, etc). 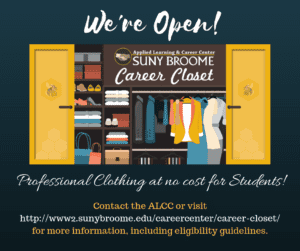 Contact the ALCC or visit the website https://www2.sunybroome.edu/careercenter/career-closet/ for more information.